Every IVF clinic has their share of unhappy patients. Patients get upset for many reasons. Their cycle may have failed ; or the treatment is costing much more than they thought they would; or they feel that the doctor's not paying enough attention to them; or that they have to wait too long; or that the staff is unfriendly. This is quite natural. After all, no one enjoys spending money in a doctor's clinic. The outcome of any IVF treatment is uncertain, and when you are sick, your head and your heart often don't work properly. Every little incident can upset you, and you often need to vent. While you may want to scream at the doctor, you are too scared to do this ; and in any case, the doctor is not easily accessible. This is why angry patients will often use the IVF clinic staff as their punching bag . The staff is often at the receiving end of the patient's ire, no matter what the underlying reason for his anger may be. This can be hard for the poor clinic staff, because they have to put up with a lot of emotional abuse for no fault of theirs. Even worse, often the doctor will also take the patient's side , because he doesn't want to upset his paying patients. It can be extremely hard to listen to a lot of rubbish from an angry patient when you are not at fault. We doctors need to learn to empathize with our clinic staff because they have an extremely difficult role to play. We need to support them and teach them that when a patient starts shouting at them, they need to keep their cool and not treat this as a personal insult. An angry patient needs to release his bile, and the clinic staff is the easiest target, which is why they often will be at the receiving end of verbal abuse. Yes, it's not fair on them, but they need to learn not to take any of these insults personally. It's hard to have to listen to the emotional tirade of an abusive patient, but just because a patient is throwing a temper tantrum, there's no need for them to lose their temper - this will just escalate the problem, and make matters worse. If the staff listens to them patiently, most patients will come to their senses, and will apologise when they realise how badly behaved they have been. When confronted by an irate patient, your staff need to behave in an extra mature fashion. They should feel sorry for the poor patient , who is unhappy and scared, and is expressing his emotions in an immature fashion. 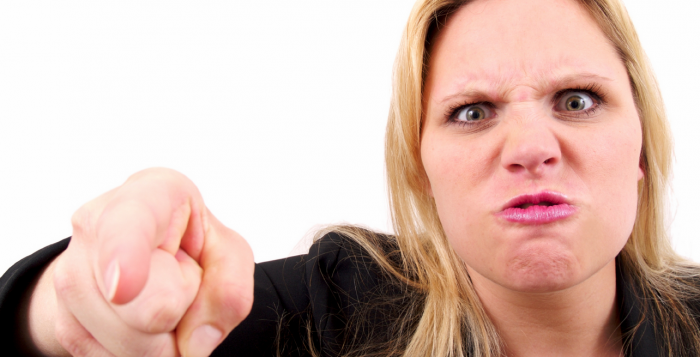 When a child throws a temper tantrum, a parent doesn't respond by having a temper tantrum himself. He understands his child's emotional distress, takes a deep breathe, cools down, and tries to get the child to see reason. This is exactly what the clinic staff needs to learn to do when a patient is angry. It's not easy, but it's a skill which can be learned, and the doctor can help them to do this. Your staff needs to have the confidence that you will back them up. If you learn to be a role model of patience and forbearance, your staff will also learn to behave in the same fashion.